Mundo Real was founded, in 2007, with the purposes of fostering sustainable community development, and empowering local residents and grassroots organizations within impoverished communities of Latin America. Currently our work is based in the urban community of Rocinha, Rio de Janeiro, Brazil. Mundo Real is an independent organization with no religious affiliations. Mundo Real employs a three pronged approach to our development work, including (1) Research, (2) Education and (3) Direct Services. Our Research in Rocinha is community-based and collaborative. It brings together people and organizations from different backgrounds to investigate and understand the root causes of the issues challenging Rocinha, and similar communities. Our Educational approach includes informational home visits, workshops, mini-courses on citizenship and human rights, disease/injury prevention and professional development. Our Direct Services have included delivering food supplies to individuals and families in need, organizing free transportation services for disabled residents to and from doctor visits and distributing health and pharmaceutical supplies such as wheel chairs, oxygen tanks, water filters, diapers and gazes/band-aids. In addition to home repairs, we provide the resources for, organize and follow through on substandard housing repairs. By doing this we strive to improve living conditions in Rocinha, and reduce disparities, primarily in the areas of public health and education. Mundo Real envisions a more humane, peaceful, and just world, where people from diverse backgrounds work together to create better lives for themselves, their families, and their communities. Community-based organizations can be powerful vehicles for overcoming the social and economic difficulties that characterize impoverished communities around the world. Our vision includes working alongside local residents and grassroots organization in order to achieve sustainable community development. 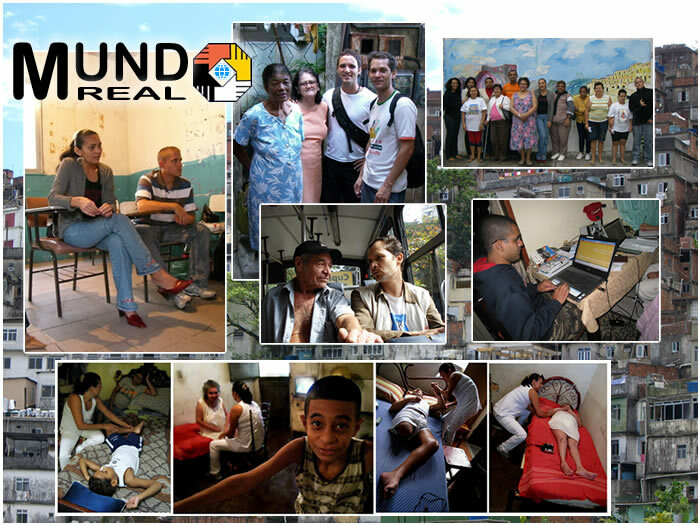 Mundo Real was founded, in 2007, with the purposes of fostering sustainable community development, and empowering local residents and grassroots organizations within impoverished communities of Latin America and the Caribbean. Currently our work is based in the urban community of Rocinha, Rio de Janeiro, Brazil. Mundo Real is an independent organization with no religious affiliations.